The EU would like to reduce waste and increase the amount of recycled plastic. The plastics industry would like to do the same. WOLF PLASTICS is already paving the way. With an internal cradle-to-cradle concept and high-quality products from reprocessed pellets. It is nothing short of an elementary transformation process, and it is already under way. The background makes sense: the fact that oil is a finite resource and that there are growing amounts of waste calls for a far-reaching strategy of how the indispensable (especially when it comes to packaging) material plastic stays available endlessly – and how there can be a more positive impact on the environment. The people agree to a large extent on the most important means of transformation. As far as the EU and the plastics processors are concerned, the solution to the availability and environmental issues lies primarily in the circular economy, which can provide high-quality materials. The raw material used should make its way back into the production process – ideally 100% of it. Further to this, the European plastics industry has voluntarily imposed an obligation on itself: the association consisting of producers, processors and recyclers aims to achieve a recycling rate of 70% for plastics packaging by 2040. It currently lies at 30%. The target may seem to be ambitious in view of the status quo, but it is reachable. In Europe the plastics industry has over 60,000 companies with 1,770,000 employees. Its annual turnover is around 363 billion euros. The fact that this industry is now proactively committed to speeding up the transformation of its base material even further is a strong, future-oriented signal. This is how WOLF PLASTICS sees it, too. “Everyone who works with plastic is interested in it being continuously circulated,” says WOLF PLASTICS Managing Director Georg Hirsch. This is why the company already launched its own cradle-to-cradle activities some years ago. From the cradle to the cradle instead of to the grave. This already applies now at WOLF PLASTICS when using many production resources. Hydroelectricity is the primary source of energy at the Austrian plant. Manufacturing is carbon neutral thanks to emission certificates. Production waste is completely reused with efficient resource management. 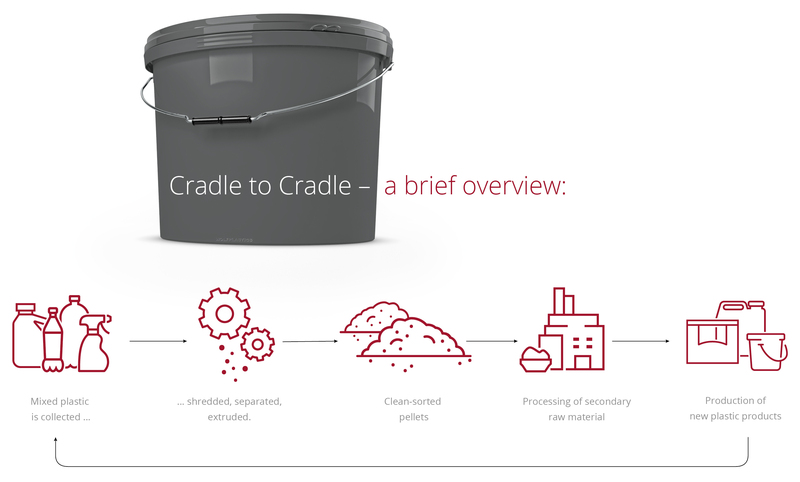 And when post-consumer waste becomes an inexhaustible source of raw material in the future, the cradle-to-cradle target will have been reached here, too. WOLF PLASTICS thus welcomes the plastics industry’s action plan regarding the circular economy. There are plans for the immediate founding of initiative groups along the polymer value chain. In the next step, investments in innovations are to be increased from 2020 and the recycling potential is to be maximised. With the support of the EU. The EU itself has defined requirements for the recycling of waste: 50% of plastic packaging is to be recycled by 2025. This roughly corresponds to the figures the plastics industry is also tending towards. This is the reason why producers, processors and recyclers have invited the European Commission and the European Parliament to support reaching the common goals. With support programmes for research & development – with incentives for investments. Plus, however, monitoring and helpful legislation so the upward spiral of recycling quality and capacities gathers momentum. Georg Hirsch is confident that it will not be possible without high investments. He also sees the challenge facing producers to think about the later recyclability as early as the product design stage and with regard to components. WOLF PLASTICS has a principle, however, which is above such considerations regarding the circular economy: compromises in the quality of the recycled pellets are out of the question. The requirements of the market have to be fulfilled in every respect. Thomas Leitgeb also makes sure this is the case at WOLF PLASTICS GROUP. Biopolymers are a different story. WOLF PLASTICS has decided to continue to keep an eye on developments for the time being in order to be able to react promptly. Natural plastics based on sustainable raw materials currently cost two or three times as much as conventional plastics.